Hello everyone! 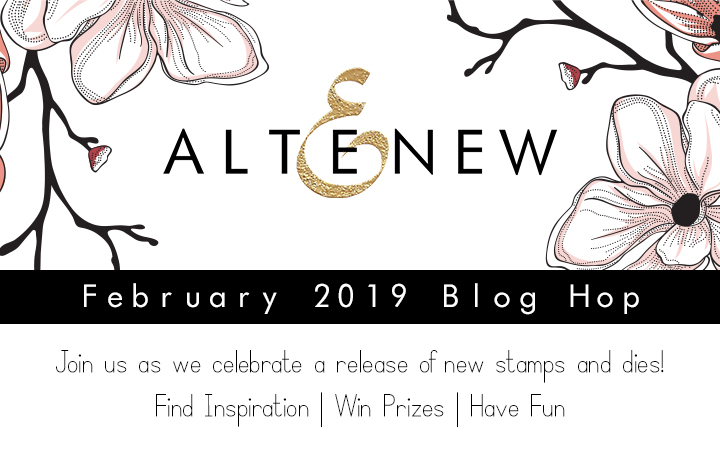 I am so excited to be a part of Altenew February 2019 Stamp/Die/Stencil Release Blog Hop today! You should have come from Kymona Tracey, but if not please start at the Altenew blog. 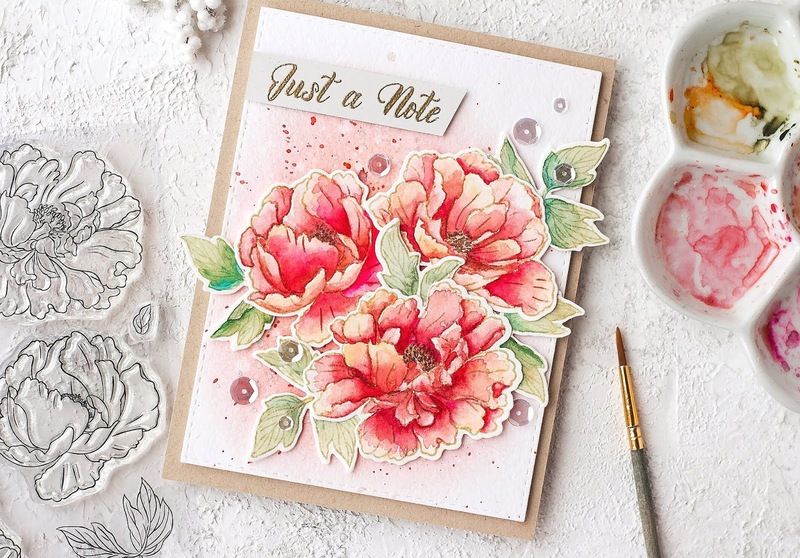 I made a several cards to celebrate Altenew February release! 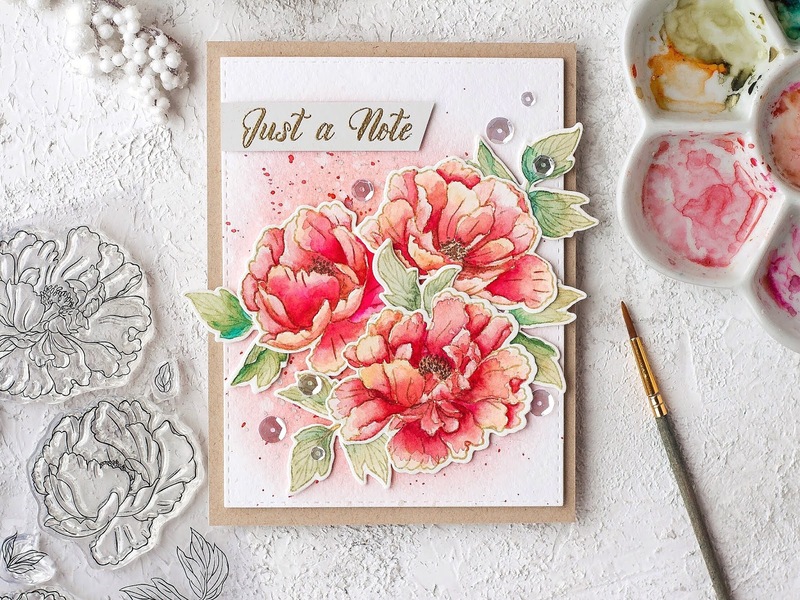 My first card featuring absolutley gorgeous Beautiful Peony stamp set. I've started by stamping the images with Antique Linen distress ink onto piece of watercolor paper. 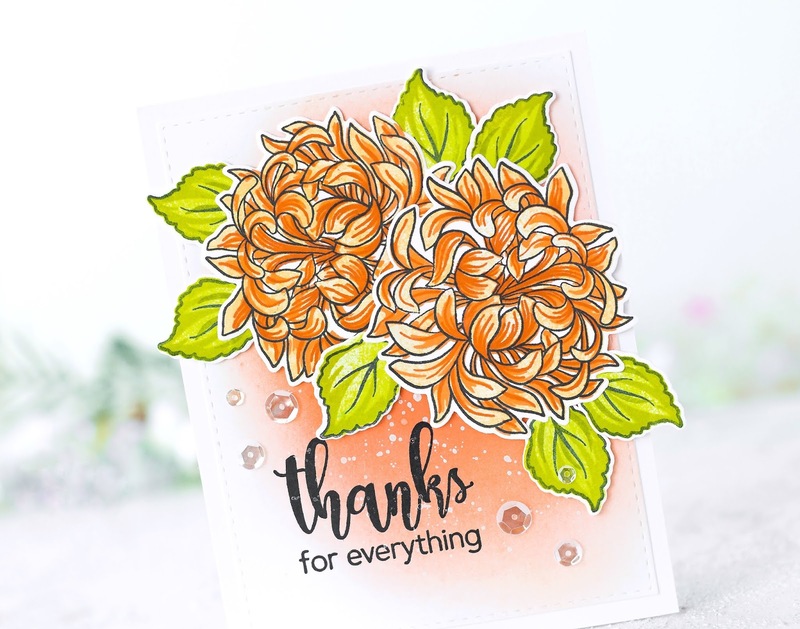 I watercolored the blooms using coral, peachy and red colors and the leaves with blue-green mixed with sepia. Once my coloring was done, I die cutting the images with coordinating dies. 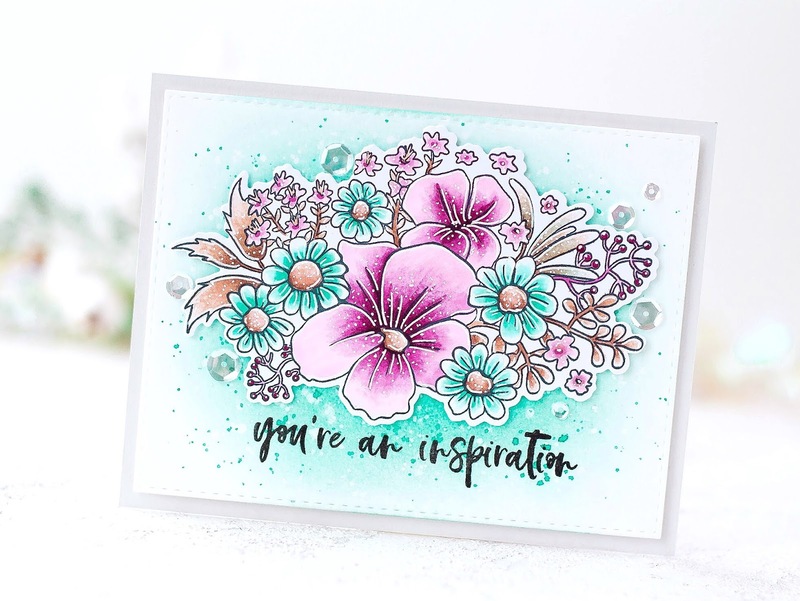 For my background, I blended some pink and coral inks onto watercolor paper, splattered it with the same inks and silver paint. Next, I adhered the flowers on top of my panel with foam tape and mounted my card onto kraft card base. 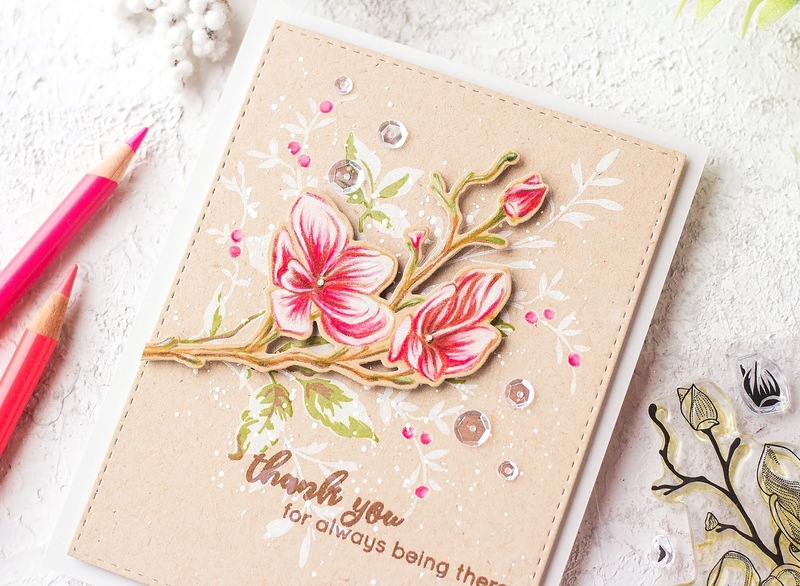 The sentiment is from Wonderland stamp set. 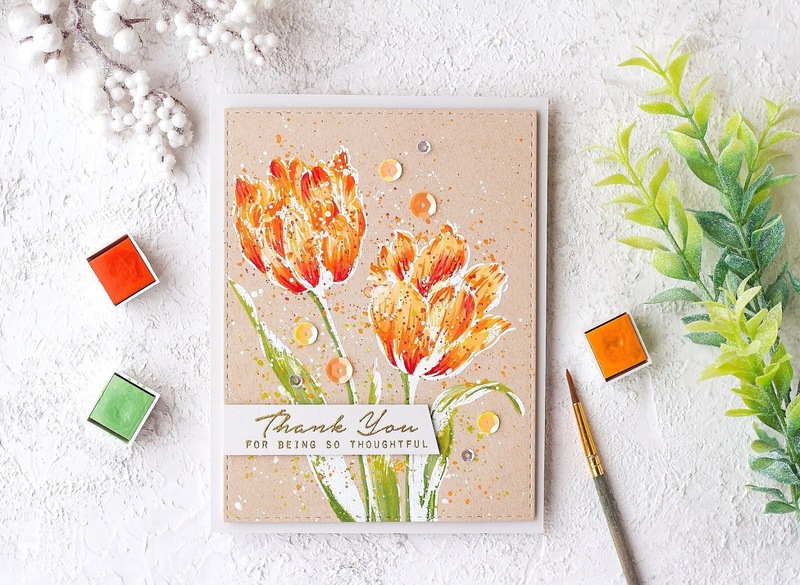 My second card featuring beautiful Exotic Tulips stamp set. 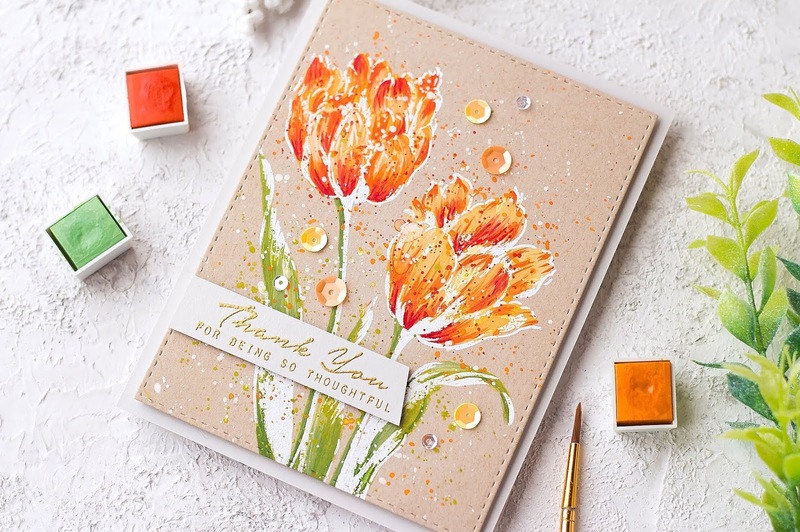 I stamped two tulips onto Neenah Desert Storm cardstock with clear embossing ink and white heat embossed. 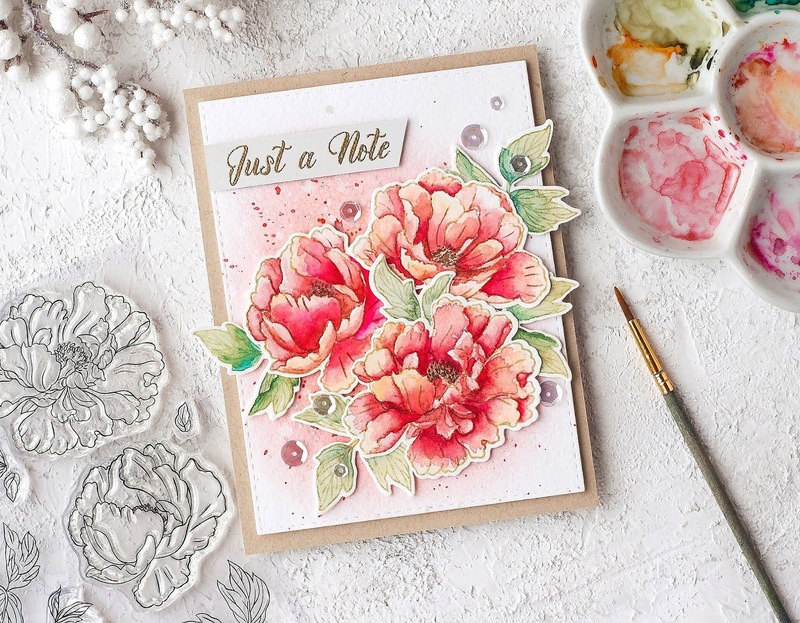 Then, I mixed Altenew paints with some white paint and drop of water and watercolored the flowers. After that, I splattered my panel with the leftover paints and also white paint. 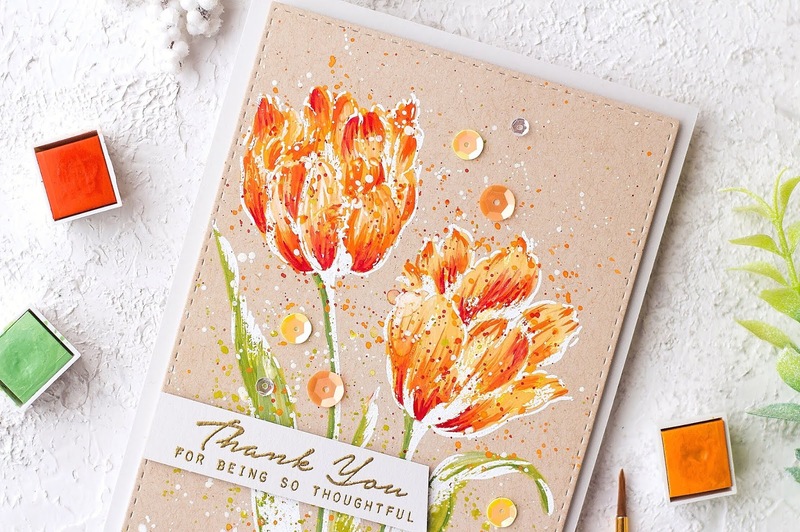 To finished my card I've added a few yellow and orange sequins. 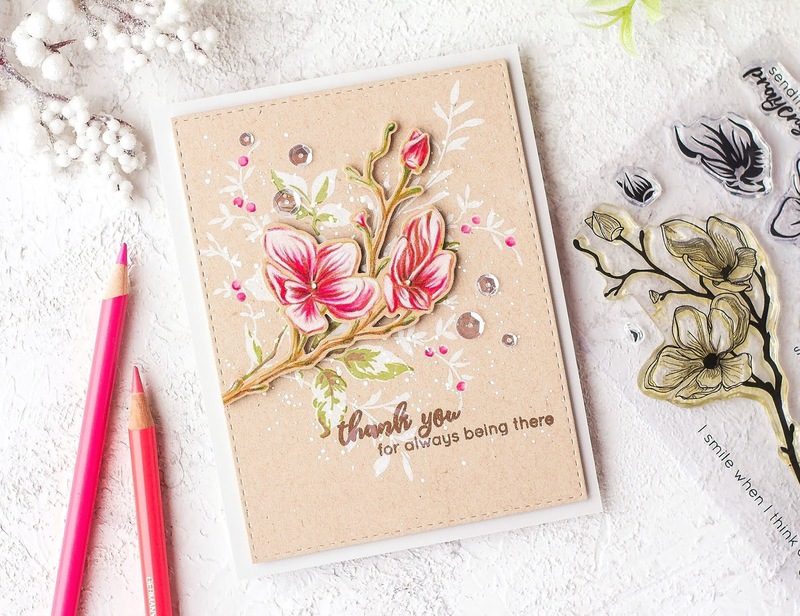 My last card featuring beautiful Dotted Blooms stamp set. 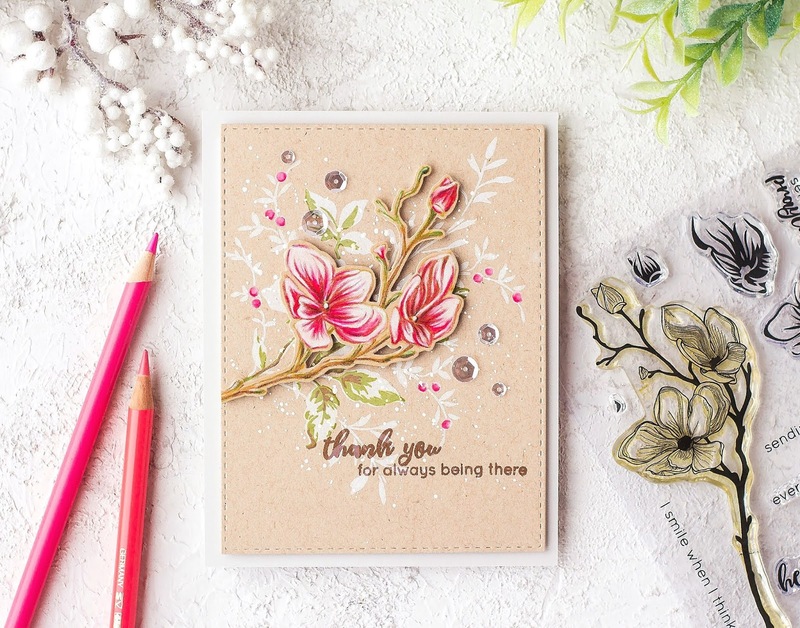 I decided to make a pencil coloring with that beautiful flower. 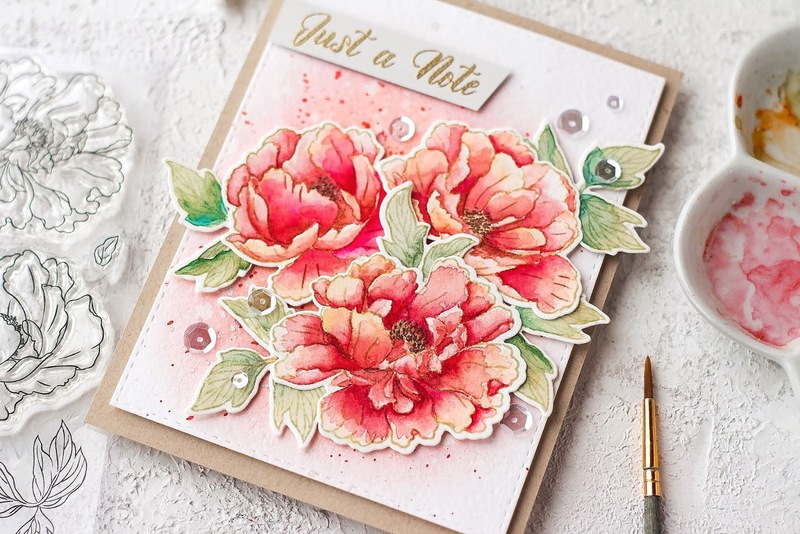 I stamped the image onto piece of Neenah Desert Storm cardstock with Antique Linen distress inks and colored this with white, pink, red, brown and green pencils. 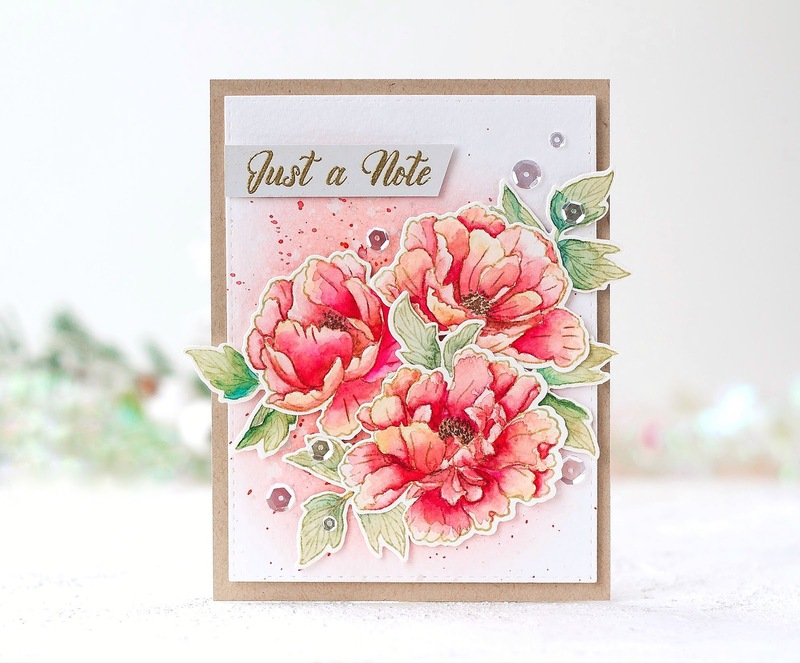 Next, I stamped the rose from stamp set onto another one kraft pane for the background. 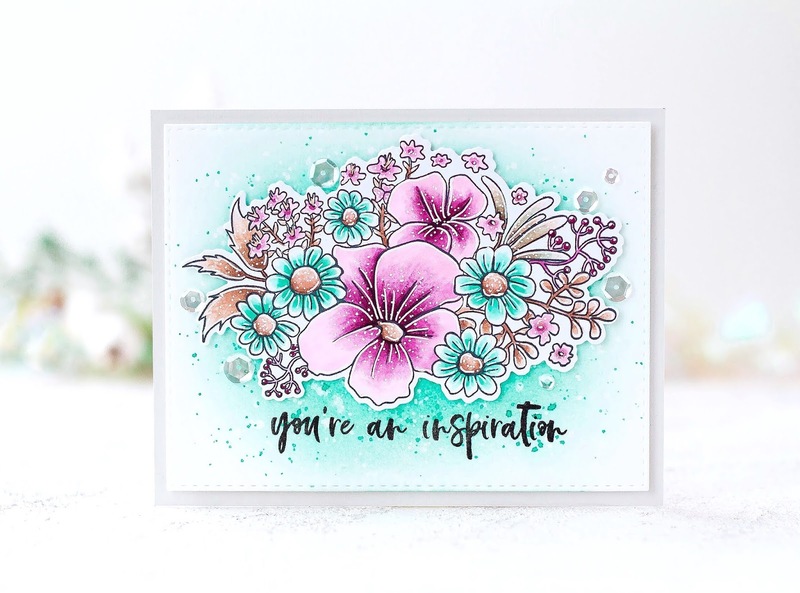 I stamped the first layer with white pigment inks and the second layer with Moss Altenew inks. 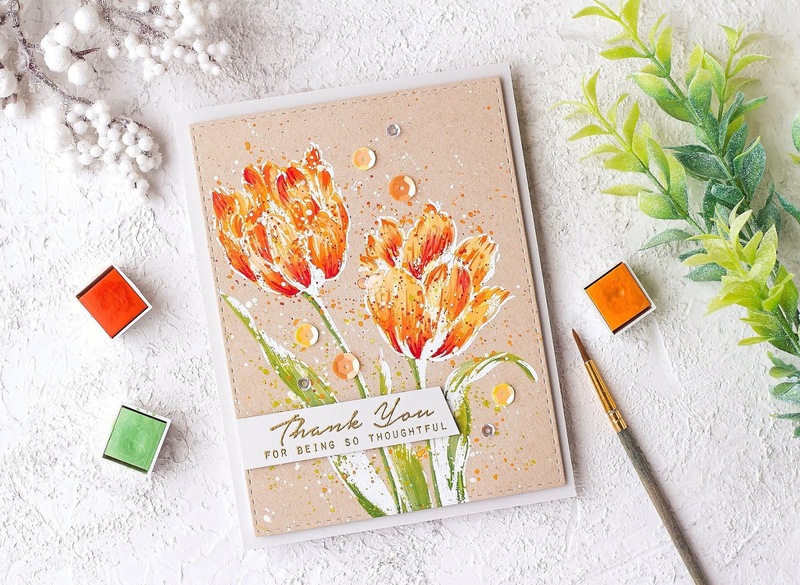 Then, I stamped the sentiment from stamp set using Chocolate Altenew inks and splattered my panel with white paint. Once it was done, I die cutting my flower with coordinating die and adhered onto kraft panel with foam tape. To finished my card I've added a few clear sequins. Hope you liked my cards! Don't forget to leave a comment for a prizes and a giveaway. Thank you so much for stopping by! Your next stop is Anna Kossakovskaya! To celebrate this release, Altenew is giving away a $50 gift certificate to SIX lucky winners! 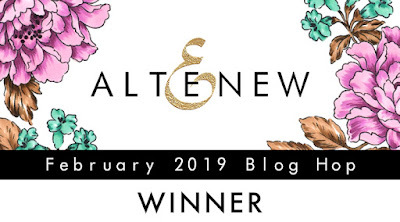 Please leave a comment on the Altenew Card Blog and Altenew Scrapbook Blog by 2/21/2019 for a chance to win. 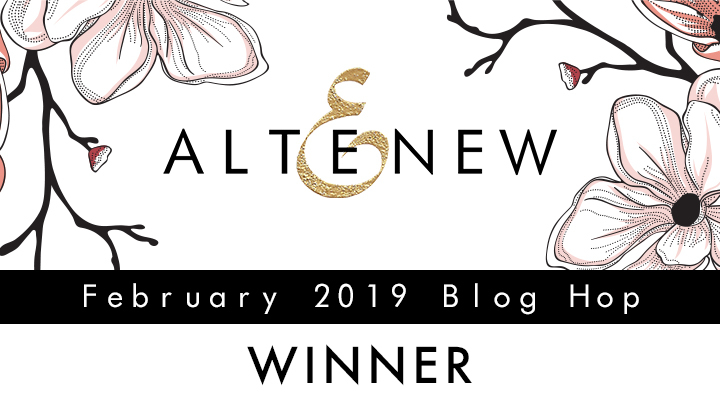 Six winners will be announced on the Altenew blogs on 2/24/2019. 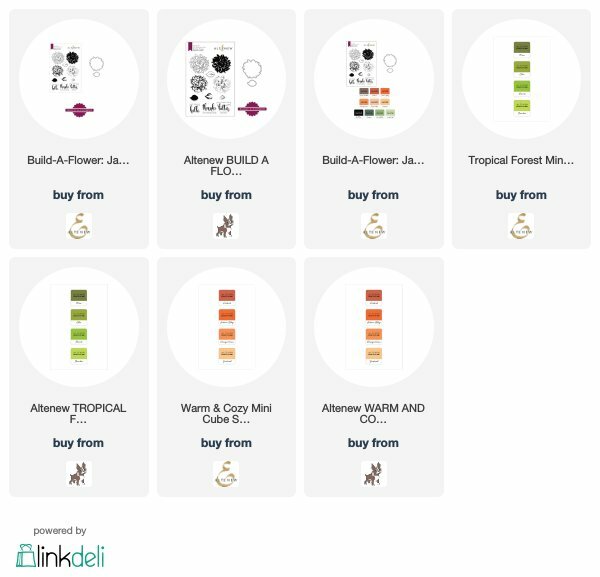 I will also randomly choose a winner from the comments left on this post and the prize will be $30 gift certificate to Altenew online store. One lucky winner will be announced on 2/21/2019 on this post. The winner of $30 Gift Certificate is PAULINE! Congratulations! 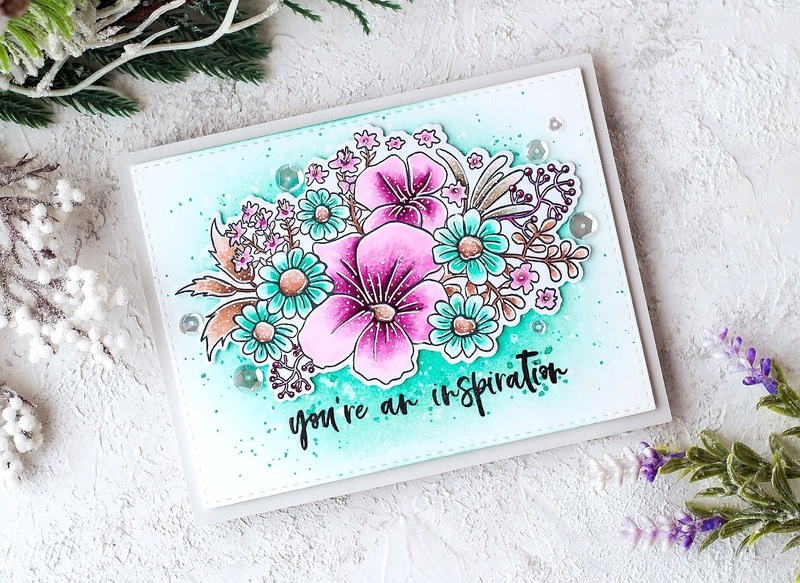 Please write at winner@altenew.com by 2/28/2019 with the subject line Altenew February 2019 Stamp/Die/Stencil Release Blog Hop Winner from Kristina's blog. Hello everyone! 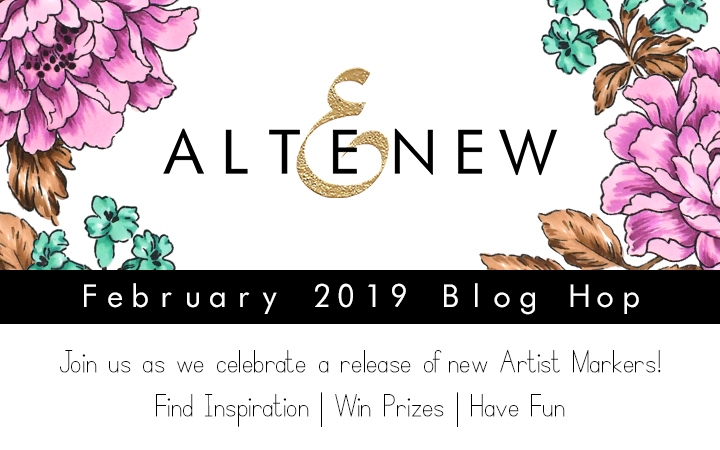 I am so happy to be participating in the Altenew February 2019 Markers Set D Release Blog Hop today! You should have come from Norine Borys, but if not please start at the Altenew blog. I started by blending a white piece of paper with Mountain Mist and Volcano Lake Altenew inks and splattered my panel with clean water and the same inks. 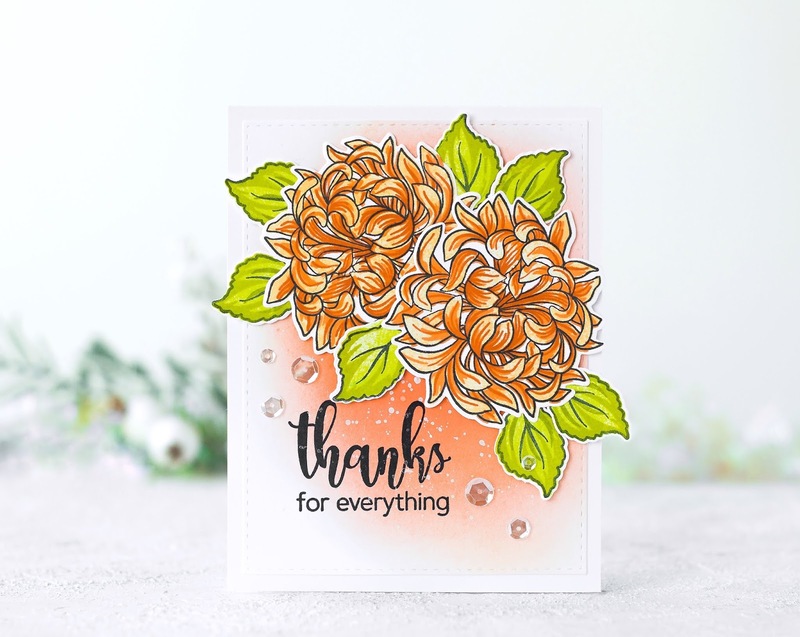 After my background was done, I stamped beautiful floral bouquet from Dearest Friend stamp set with black ink onto white piece of paper. 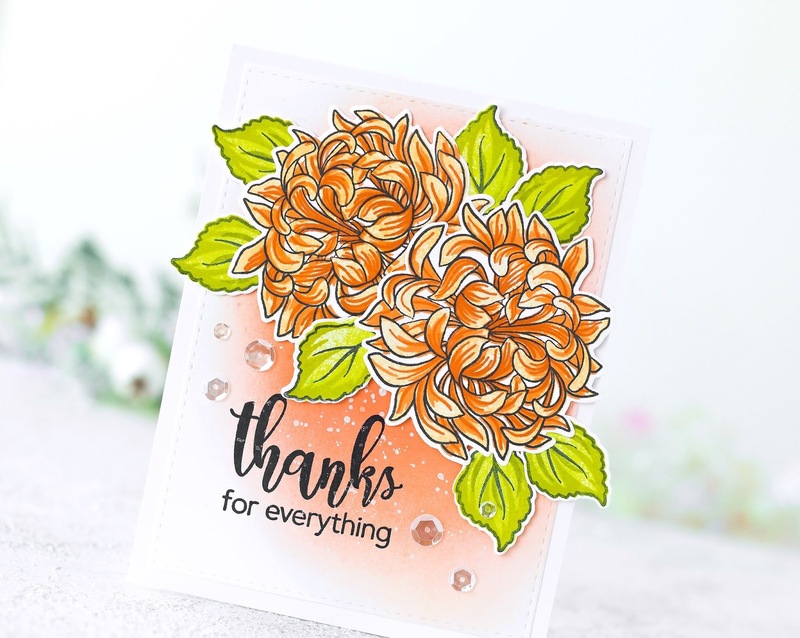 I colored the images with new Altenew Artist Markers set D featuring Altenew Colorless Blender and die cutting the image with coordinating die. 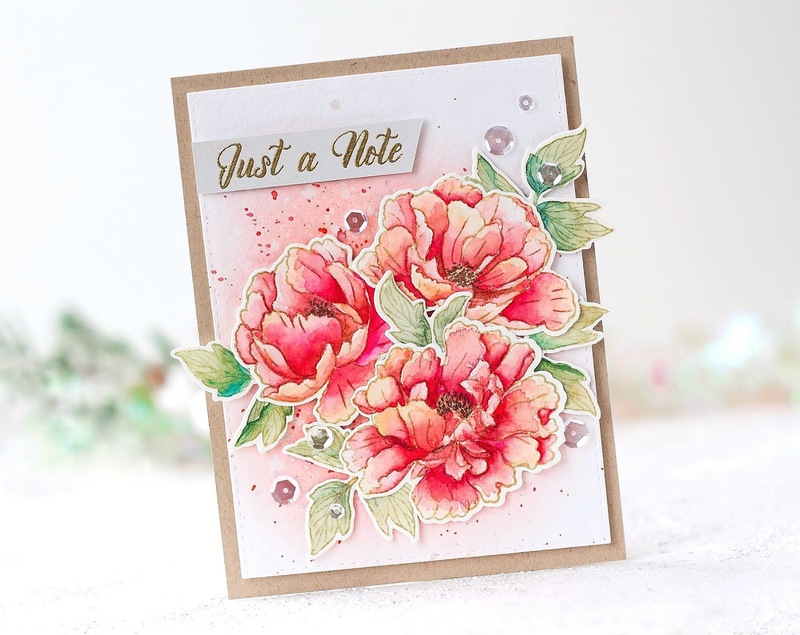 The sentiment is from Inked Rose stamp set. 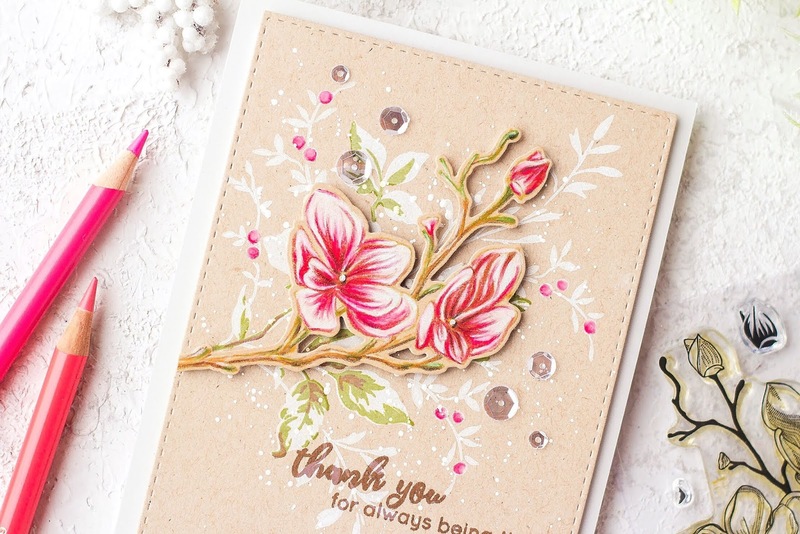 To finished my card, I adhered the flowers on top of my panel with foam tape and added a few sequins. To celebrate this release, Altenew is giving away a $50 gift certificate to SIX lucky winners! 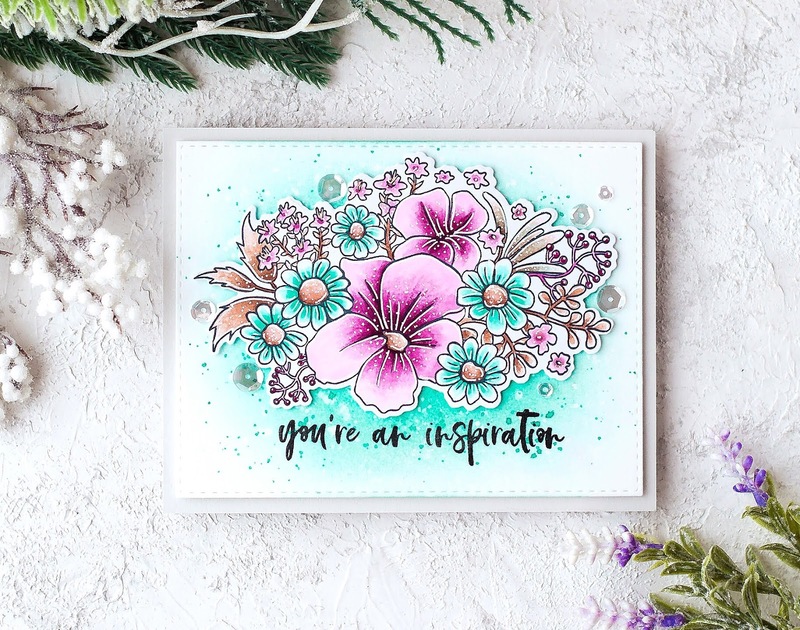 Please leave a comment on the Altenew Card Blog and Altenew Scrapbook Blog by 12/12/2018 for a chance to win. Six winners will be announced on the Altenew blogs on 2/16/2019. I will also randomly choose a winner from the comments left on this post and the prize will be $30 gift certificate to Altenew online store. 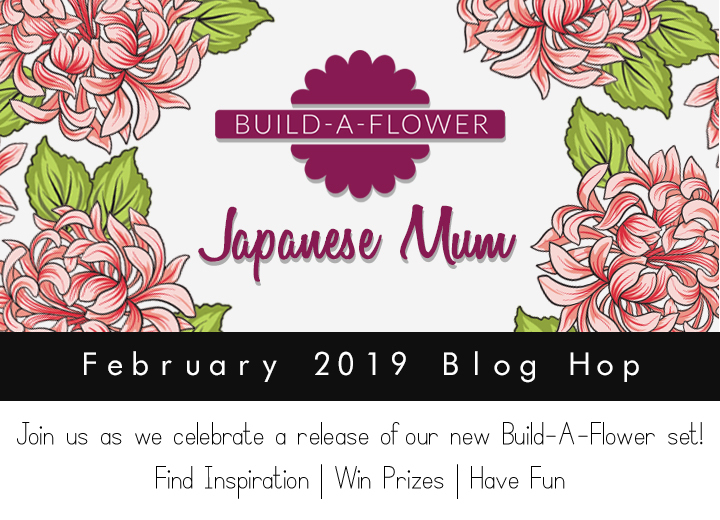 One lucky winner will be announced on 2/13/2019 on this post. Hope you liked my card! Don't forget to leave a comment for a prizes and a giveaway. Thank you so much for stopping by! Your next stop is Virginia Lu! 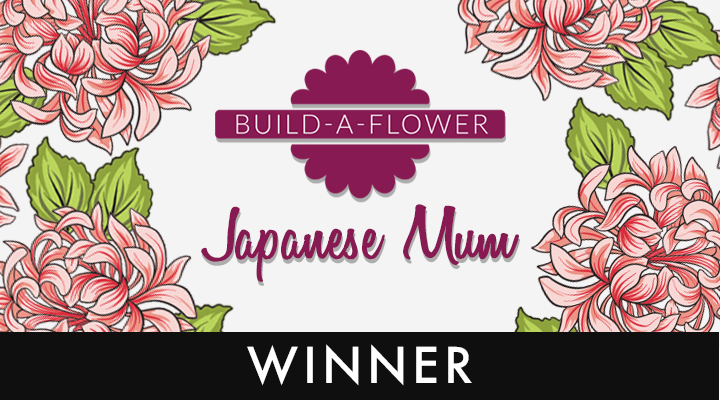 The winner of $20 Gift Certificate is MINDY1414! Congratulations! 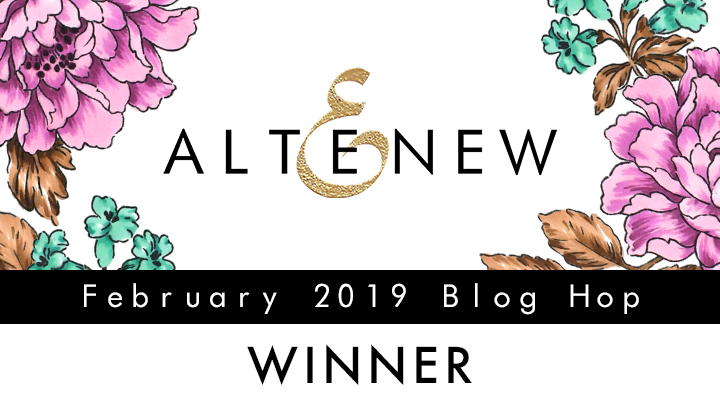 Please write at winner@altenew.com by 2/28/2019 with the subject line Altenew 2/7/2019 Release Blog Hop Winner Winner from Kristina's blog.